An extra day has been added to the normally, two day event, meaning visitors have even more opportunity to start their Christmas shopping early! The market will start on Friday 2nd November and run through to Sunday 4th November with a record number of businesses already confirmed to exhibit. Opening times on the Saturday and Sunday will also be earlier too – from 10am, to allow for those early birds to make the most of the day! Friday visitors will also benefit from free admission to the Holker Gardens included in a Winter Market ticket! 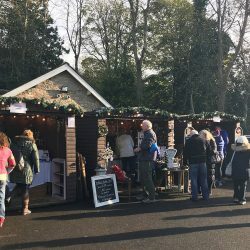 Set in the atmospheric Holker Courtyard, browse over 100 stalls of local and regional food, drink, craft and homewares for the winter season – a perfect Christmas shopping opportunity. 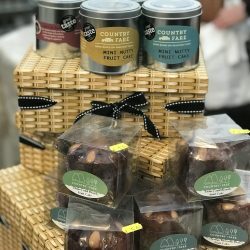 A delicious variety of food will be on offer from the likes of Cartmel Cheeses, Cartmel Sticky Toffee Pudding, Country Fare and Susan’s Farmhouse Fudge! A fine selection of gifts and homewares from Ellis & Eliza, Fassi Mare and Bespoke Aroma to name a few plus, for a warming tipple there will be a wonderful selection of drinks and local ales available, including those from Kin Toffee Vodka and Unsworth’s Yard Brewery. Live entertainment will run throughout the event with Pete Moss the Gardener, Andy Jester stilt walking and Palladium Jazz Trio providing the music. New for this year – Discover the Holker Courtyard Café Marquee – a German themed Bratwurst Bar serving all kinds of winter treats. Delicious handmade Cartmel Valley Game Bratwurst sausages – wood fired through the pizza oven and served into Fat Flour artisan crusty sub rolls. Plus, Unsworth’s Brewery hand crafted ale designed for the event and German lager, hot Gluwhien, mulled cider and Bailey’s hot chocolate. For a sweet treat try the new, homemade winter berry and cinnamon scone with clotted cream and morello cherry jam. £3 per person. Free parking. Gardens open Friday only, 10.30am – 4.00pm. Café, Food Hall and Gift Shop open 10.30am – 4.00pm.